The most recently posted book on the front page of the Archive is now called out a bit more from the others. The idea being to call more attention to new entries instead of throwing new work into the abyss and hoping someone notices. It’s a design decision I stole from my old blog that I’ve been meaning to implement for a while now. Big thanks to Yentus for reminding me that our current design was lacking. Also note that if you guys have any thoughts or feedback on other design improvements we can be making, we’d love to hear them. Either email me (ben [at] general-projects.com) or feel free to comment below. 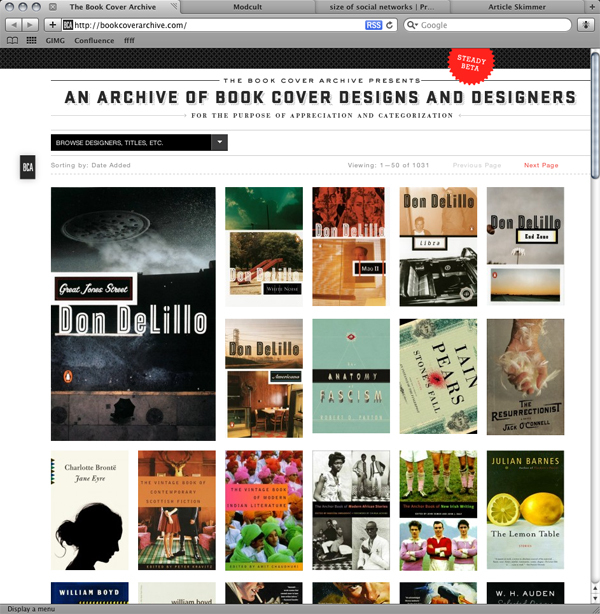 You are currently browsing the Book Cover Archive blog blog archives for March, 2009.